...Salt on the margarita needs to be kosher. Limes fresh from the tree...if possible. A "real" marg need only three ingredients. My husband makes them even better. Tough job...but someone's gotta do it. I'm off for the weekend...so none this week. But next...perhaps. I adore margaritas! We had friends over for dinner, and one of our friends made mojitos. I politely drank one, wishing with every sip that it was a margarita! I switched the triple sec and tequila ratios because I like the taste better. Love this and love the pics, fresh and inviting. I don't think I've ever had a Margarita; been there, done that but never a Margarita!! Ohh! However, sipping on a 'White Shiraz' at the moment (4pm is 'wine o'clock') - it's a lovely, cold sparkling pink. Oh my very favourite tipple! How wonderful you have the best Margarhita Maker in town - hold on to him very tightly, he's gold. The best I've ever had was in a hole-in-the-wall Mexcian restaurant in D.C. Very humble, but lovely folks & jugs of Margarhitas to die for. I can still taste them & I'm 12,000 miles away! Now a margarita, that is something I miss - we don't really drink those kind of cocktails in France, usually some derivation with champagne or wine. I think I must get shaking this summer, xv. I love looking at the images on your Blog. As for Margaritas, love them on a Friday eve, watching the sunset. We're living in Baja for 6 mo. and have perfected a great Margarita recipe as well...the secret ingredient is beer, use instead of the orange liquor. Enjoy. Tough job, indeed. Are you hiring? Will work for margaritas! YUM! Can I have one for breakfast?? Oh my! I love margaritas and must admit to not having one in over a YEAR! They don't make them here like they did in Texas! (The Mexican food restaurant we go to here when we are desperate! makes them using a powder mix! :o) I must try your recipe as Dan has been asking for some! I used to use the pre-mixed juice (gag, I know), but just can't do that anymore (corn syrup and all...) I agree kosher salt is a must, and I especially love it when I can plan ahead and do the salt in advance so it hardens on the rim. Your marg photos are so pretty I'm craving a marg....and it's only 8 AM!!! Bad you! Count me In! Margaritas on a hot tropical day! Great post! By the way, loving the picture at the top of your blog! oh is it wrong to crave these for breakfast? i could cha cha cha the day away! well, after a long siesta~ dynamite pics, talk about the power of suggestion! Oh my word Linda - You're speaking in "Debbie" Language! The margarita is my absolute favorite drink "hands down". I don't have it often but when I do, I savor every little bit of it. Goodness how I love margaritas... and avocados, tomatoes, cilantro, feta.... this post is just plain fabulous! What time is happy hour Linda? I'll be right there! You have me crazy some Miexican food & avacado. So true, Love love love margaritas. And yes Cointreau is better than triple sec! That is a good JOB too... very FASHIONABLE! You had be at MARGARITA... ENJOY your day! BTW I will be having margaritas tonight in your honour! Hope you are feeling better! That's it I want to come to your house ;) I'll be trying your margarita recipe in the summer...well if we ever get one in the UK! LOL! That margarita looks so yummy right now! Oh I love margarita's. Especially while lounging on the beach! They're already delicious and you make them sound even better. And here I am, sober for Lent. and thirsty! The first thing my husband said to me this morning was, "Is it time for a margarita?" It's my fave. I add a little honey to mine. I remember bits and pieces of when my dad had his camper in our back yard ...we would play in it but all we had were popsicles. noo margarita's that's for sure. funny thing is I can't remember all the flavors we had. !! think i'll go make myself one! Your messing with my head. GAWD, this looks so good. Yumm....Friday's is usually Margarita Happy Hour and Tex-Mex food. You are correct...Fresh Lime is the way to go! Living in San Diego, we have some damn good margaritas here - last Saturday some friends joined us at a place called Joses Courtoom-we had three pitchers - a little headache the next day!! I like the strawberry ones :) yum. OMG, that looks sooooo delicious! My FIL makes the mojitos from scratch each year at the reunion and I imbibe just a bit. Yum. In a decanter mix 1 can frozen Bacardi Margarita mix (accept no substitutes here) then fill the can with Cuervo Gold and pour that in. Then add half a can of Triple Sec (lately been substituting Patrone Citronge). Fill with lots of ice and shake vigorously. 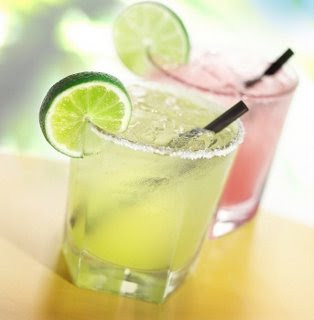 Prepare glasses with salt, pour drinks and squeeze the juice from a quarter of a lime on top of every drink. Throw the lime in as garnish. Hey, Linda, if you need any help on that quality-control tasting team, I'm your girl. The perfect margarita is a work of art. Love me a good Margarita and just like another fave of mine the Cosmo, Cointreau is the best i so agree !!! Nah, that is my house............ just kidding, beautiful shot! Just found your blog and can't wait to see your plans! It's Wednesday morning and this sounds de-lish. And it's only 11.30 in the morning. What's wrong with me?! I've got a thing for margaritas. No to triple sec, eh? Ok. I will give it a try this weekend!! yum yum! I love margaritas they are my fav. Cute post.